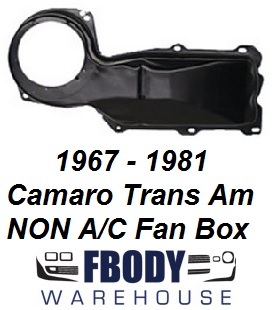 This is a new replacement BLACK outer fan box cover for 1967 - 1981 Camaro and Trans Am. For use on NON air conditioning cars. This is the HIGHEST quality reproduction available in the market today! Proper stamping and thickness ensures a proper install and a great way to make your engine bay come alive once again! This is a new replacement outer fan box cover for 1967 - 1981 Camaro and Trans Am. 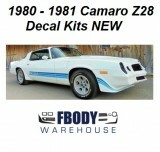 1967 1968 1969 1970 1971 1972 1973 1974 1975 1976 1977 1978 1979 1980 1981 Camaro Firebird and Trans Am models. New tooling reproduction. Accurately stamped from OE gauge steel. Gloss black painted.